Travis Jordan Fischer is accelerating toward his dream of professional IndyCar racing, and Grand Canyon University is providing the track to get him there. Fischer, 21, who goes by “T.J.,” enrolled as a GCU online student last year to continue his education and racing career. 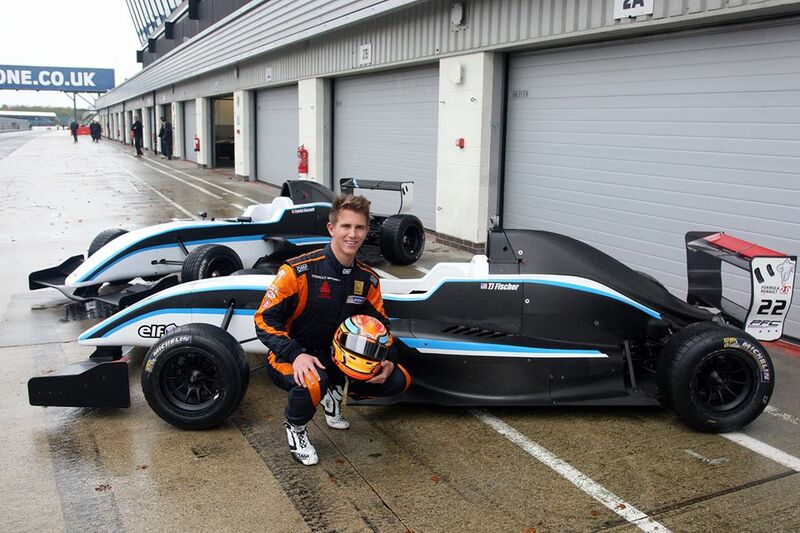 He won three national race championships in 2013 while at Pacific Lutheran University in Washington but nearly stopped racing when he earned a spot in the Protyre Formula Renault Championship last March in England. 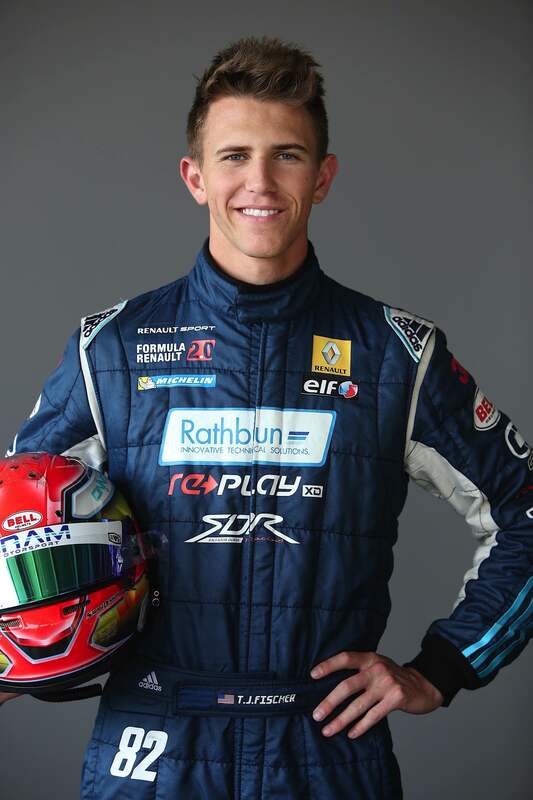 A traditional education at PLU made driving in Europe nearly impossible and would have forced him to choose between college and racing, but then a friend turned him on to GCU’s flexible online program, which allowed him to chase both passions. Working on studying with his racing schedule helped Fischer climb the IndyCar ladder in his first year in Europe. 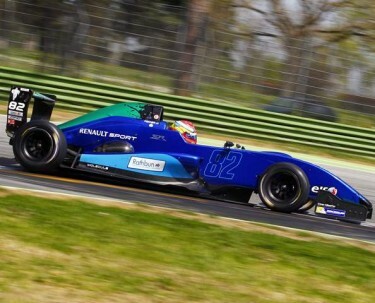 He ended the 2014 series with a sixth-place overall finish and moved up to the Formula Renault 2.0 ALPS Series this year. He will compete in seven races in five countries across Europe through October. Fischer is succeeding in the classroom, too — he has a 3.5 GPA even though he is eight hours ahead of his classes. The junior business management major credits GCU for his rapid academic and racing ascension. “It’s easy to forget about education to focus on your racing career, and then you’re 25 and haven’t taken a single college course. I didn’t want that,” said Fischer, a native of Vacaville, Calif., who grew up racing go-karts. Like Fischer, more than 55,000 GCU online students across the U.S. and in several countries are able to fit college into their busy lives. GCU’s online platform allows students to work and learn at their own pace, and online students receive the same quality education as their traditional counterparts. The University employs nearly 200 online full-time faculty members, which differentiates it from other universities. Fischer said the flexibility of GCU’s online program made it possible to earn an education while racing in Europe. Instructors also are dedicated to driving students’ success. Students can contact instructors six days a week by email, phone or through online forums. Instructors are required to reply to questions within 24 hours and post assignment grades in four days. Adjuncts, who teach a majority of entry-level courses, must post grades within a week. Instructors also frequently contact students before a class starts and during class to answer questions. Fischer works with his teachers to account for the time difference and notifies them if race times interfere with assignment deadlines. Contacting his professors from Austria or Spain is just as easy as from California, he said. Gary Almy, a Colangelo College of Business online full-time instructor who works in GCU’s Tempe office and is a ground adjunct professor, has worked with international students and said the program is designed to fit their needs. Almy works with other instructors in Tempe, who all share best practices and tips. Almy, like all instructors, posts tutorials and guides in different modalities to help students of various learning preferences study on their schedules. He said knowing students’ backgrounds is the key to success. Success in the highly competitive Euro series hasn’t come easily. Fischer got off to a rocky start, with a crash in his first race, the Imola Circuit at Imola, Italy, in April. He has improved, with a twelfth-place finish on Saturday and a seventh-place finish Sunday in the Grand Prix de Pau at Pau, France. His goal is to finish in the top three before season’s end. Fischer earned six top-five finishes in 16 races and finished sixth overall in the UK in 2014, which earned him a spot in the 2015 ALPS series. Fischer will race on some of Europe’s most prestigious and difficult formula racing tracks throughout the series. Tracks include the Spa Francorchamps in Belgium, the Monza circuit in Italy and the Red Bull Ring in Austria, among others. Fischer is happy with his progress in Europe and his ability to apply the teachings from his business courses to his career. He is responsible for signing his own sponsors and managing his finances and brand while in Europe. He also helped create and manage an Indiegogo crowdfunding campaign to raise funds for his travels to Europe. He hopes to manage a racing team when his driving career ends and said the business knowledge he is gaining at GCU is helping that dream become a reality. For up-to-date race results, follow Fischer on Facebook (Facebook.com/TJFischerRacing12), Twitter (@TravisJFischer) or at www.TJFischerRacing.com.